As the jingle states, Grinch is as cuddly as a cactus but recently we caught sight of the notorious Christmas hater and he didn't appear very prickly to us. He must have undergone a bit of a makeover recently because he no longer reminded us of a succulent, on the contrary, he looked soft, cozy, and even appealing. We thought about giving the guy a hug instead of picking up all our presents and running in the opposite direction. His once spiky, moss-like flesh was replaced with green fur that looked lusher and more inviting than a thriving garden. The single sprout of hair atop his head appeared to be freshly washed, conditioned, and even combed. We'd be lying if we said we didn't want to run our fingers through it. Grinch's unenthused expression was still the same but we could tell there was something different about him. We worked up the nerve to ask about his attitude adjustment and that's when he told us about Kigurumis, the newest loungewear craze. 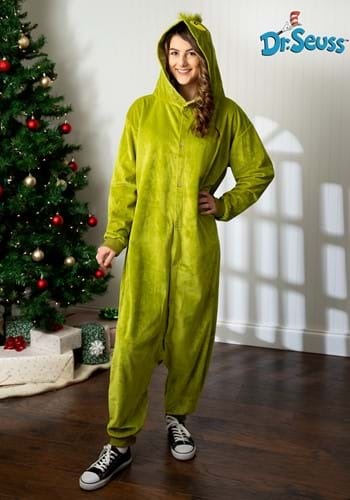 The Grinch said he was happier and softer thanks to The Grinch Kigurumi and that's when we knew we had to have it. It's now number 1 on our Christmas list! The versatile pajama-type costume comes in one standard size that is capable of fitting both adult men and woman. The costume buttons up in the front and features stretchy ankle and wrist cuffs for a fitted look. The hood features a cartoon Grinch face and the entire costume is made from soft, plush fabric so it's extremely cozy and warm. Great news, this costume comes in handy as a costume to be worn on Halloween or as a funny pair of pajamas that can be worn on Christmas Eve night, just don't let Santa Claus see. He'll get jealous!